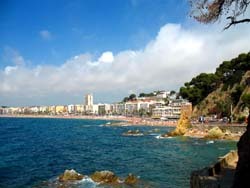 The presented room availability, rates and discounts are actual and final for all our 192 hotels in Lloret de Mar. Prudent tourist should give preference to the hotels situated in the suburbs of the resort. The pricing of the hotels centered in the heart of the city is rather high. Many tourists prefer living in neighbor towns and just visit the beaches of Lloret De Mar. One of the most popular transportations of the resort is surely a motor boat. From the early morning till late night the coast line is cruised by many motor boats which let you easily and simply transport through the coastal territory as well as reach the neighboring cities. The service fee is rather affordable. For example the trip to Tossa and back will cost about 15 euro. The currency is strongly recommended to be exchanged only in specialized currency exchange counters as these offer the most profitable exchange rates. The exchange counters hosted by the hotels apply high fees for the service and the exchange rate is not as profitable. All the beaches of the resort are public and free for visitors. Additional charge may be applied for sport or beach equipment rent. The resort has adopted a system of tips. Cash reward should be given for every service you get. The tips should be given to waiters in the restaurants and cafes, to maids in the hotels and to guides and taxi drivers. A reward equaling to 5-10% of the total sum will be quite enough.